Nicely groomed nails are one of the best accessories in a girl’s closet. With new trends in nail color and nail art, it is easy to choose a fingertip expression that highlights your personal style and adds that something special to your look. The manicure and pedicure stations at Phagans Clackamas Town Center Location. But when nail polish chips, peels, or smudges, it can ruin your overall appearance. Like a run in your pantyhose (thank goodness we don’t wear those anymore) or lipstick on your teeth, a messy manicure can become the focus of attention for all the wrong reasons. If you’re tired of spending time at the salon having your nails done only to see chipping and cracking a few days later, a gel manicure may be just the answer you’re looking for. Since we’re offering a special on gel manicures in October in our Portland salons (sign up for our newsletter at the top of the page to get monthly coupons and specials) we thought we’d take closer look at gel manicure pros and cons. Gel manicures have staying power closer to acrylics without doing the damage to your nails that can happen with glue or fake nails. The process begins like a regular manicure with your nails being shaped, smoothed, and buffed and your cuticles being cleaned up and trimmed. Then the manicurist will rough up the surface of your nail using an emery board or metal file. This slight texture on your nail surface will help the gel adhere better. Finally, the manicurist will apply a gel base coat, gel color of your choice, and a gel topcoat. In between each of the application steps, you will bake or cure your nails under a UV lamp. This ensures that the gel adheres correctly to your nails and dries completely. Usually by the time you leave the salon, your nails will be completely dry – no more worrying about messing your manicure as you dig for your keys at the bottom of your purse. Gel helps reduce chipping, especially in the first week. For busy gals in Portland, Oregon, the pros of a gel manicure are definitely intriguing. First, they say that the gel polish won’t chip, crack, or budge once it is appropriately applied to your nails. This is quite different from traditional nail polish that can smudge in the car on the way home from the salon. Gel-manicured nails also stand up to activities of daily life in the Northwest. Whether you’re growing your own vegetables in the back yard, going clubbing downtown, or camping and hiking in the fresh fall weather, your nails will look great. Needless to say, daily hand washing or work activities won’t damage this manicure either. Finally, the best part of the gel manicure is the length of time it will stay fresh on your nails. Most salons report that a gel manicure will last for two to four weeks, an unheard of length of time for your nails to look great. The number one reason for a touch up on your gel nails is simply nail growth. After a couple of weeks, your nails grow out leaving a gap at the cuticle with no color that will require another trip to the salon. 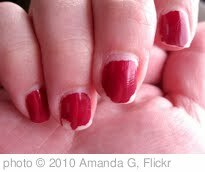 If gel manicures are not applied correctly, they have a tendency to lift or peel at the edges. For this reason, it is important to choose a salon where you know the manicurists have been trained well in the gel technique. Students at Phagans are trained in the latest, most hygienic procedures, so you know our student salons and salons throughout the Portland are where our graduates work are all a good bet for trying a gel manicure. Because the gel polish bonds so tightly with your nail, removal of a gel manicure requires more than just a bottle of remover and some cotton balls. You’ll most likely need to visit the salon again to remove the gel. That process can include the manicurist soaking your nails in acetone and scraping off the gel. This process may need to be repeated a few times to remove all the gel. If you like to change your nail color quite often, this removal system and the staying power of the color may make gel manicures less appealing to you. Finally gel manicures are generally more expensive than traditional manicures. But if your gel manicure lasts 2-3 times longer than a basic manicure, the additional expense won’t actually increase your costs because you’ll need fewer manicures. If you’re looking for a long-lasting manicure without going the acrylic route, gel manicure may be just what you’re looking for to pull your look together effortlessly. This entry was posted in Discounts and Coupons, Nails, Styling Tips. Bookmark the permalink. I wanted to know if a gel manicure could be harmful to your health in some way. I decided to get the gel manicure wasn’t happy.I been getting regular manicures for the last 5 year weekly so when I decided I was told it wouldn’t ruined my nails so not the case. If looks like or appeared I gotten acrylics nails. I had to cut my nails for the next 2 months allow my nails to heal. I would not recommend gel nail polish to a natural woman. Due in time in it takes layer of your nail. Lessons learned…..
You can’t peel them off yourself. That’s why that happened to your nail. You must get a piece of cotton ball, but pure acetone on it and with aluminum foil wrap around the nail. Then it literally peels off, leaving your nails perfect. gel DOES chip and peel. I’ve had it done 13 times total, different brands, salons, etc., and it STILL does. I am not impressed at all and would never recommend it. I just had my first gel manicure and it’s been 6 days with no chipping or peeling. I can’t speak for the removal process just yet, but hopefully it’s not as damaging to my nails as some make it out to be. For now though, I love it and my nails look great. I am getting a manicure and pedicure tomorrow.I want to get acrylics,but i dont want to ruin my nails and im kind of a tomboy. I am temped to try the gel nails but it sound like there is negative comments on them and i am young so long nails kind of ruin plans. Any tips?? I had my first ever manicure two weeks ago, and I chose gel nail polish. It has held up wonderfully! I wash dishes every day (no electric dishwasher in our house) and generally use my nails as tools. No cracks, chips or lifting of the polish. I love it and will have it done again. It should last a 7-14 days. If you got it at Phagans let us know which location and who did the work and we’ll see if we can get you in for another one on the house. I got a gel nail polish manicure it was awesome the first day…but by the second day my middle finger nail was already chipping…then the next day I noticed my pinky finger was chipping…what is going on? Did they do it wrong? Should I get my money back? Should I put a top coat of regular nail polish on top of my gel nail polish so it stops chipping? Lost at what to do. I am 7 days into my first gel manicure. I had 2 shows on Sunday with wardrobe changes all day and a week full of typing. No chips, the color is as strong as ever. I am looking forward to seeing how long I can stretch out the manicure for and to seeing what the removal process is like. I was gifted this at an event by CND Shellac and so far am very happy. I had a gel manicure done over a year ago, before going on a trip. My nails looked great. BUT I developed a nail fungus for the first time in my life. I usually wear gloves when doing dishes, since my hands tend to get very dry. So this should have protected my nails as well. Still when I had the gel removed three weeks later, I notices that a part of my nail was discolored. It was yellow. It turns out that I developed nail fungus. Painful and ugly. I saw a dermatologist, and was prescribed pills that I had to take for a month. It has been about a year since then, and my nail is still not completely fine. A part of it seems to by just not attached to the nail bed. I saw the dermatologist again, and he told me it takes up to a year for a finger nail to grow out. Meanwhile, the nail is really unsightly, so I have to apply nail polish all the time, to cover the spot where nail is detached from the nail bed. Paying a heavy price for two weeks of pretty nails. It says you had removed them after three weeks, but you’re supposed to get them removed after 7-14 days. I think that’s why you got nail fungus. I have been a nail biter for 30+ years. The only time I’ve been able to grow them has been when I’ve been pregnant (and they break as soon as I do something). I have rarely painted my nails in the past. Last year, my husband had his 30th high school reunion. I decided that I wanted to do a pink/white set. I had whelps the next day on my face and neck. I am allergic to formaldehyde (formaldehyde is in the pink/white process but I didn’t know it) and was sad to remove the nails the very next day. My whelps then disappeared. I’ve decided I want pretty nails for 2013. My newest salon listened to my concerns….was there formaldehyde in the gel polish? They made a couple of phone calls and read all the ingredients. They felt gel polish was safe for me. I had my first gel polish applied two weeks ago. My nails were very short when I started. I don’t care for the buffing of the nails, but did the process. My polish lasted two weeks and I felt the new growth looked bad and didn’t want to wait any longer to have a new polish applied. I had only one small chip at the top of one nail. It was a light color and hardly noticeable. Nobody told me how long the gel process took (about 1 1/2 hours total). Soaking the old polish took about 20-25 minutes for me. I still don’t like the buffing…feels like my fingers are sore. I’m not crazy about the UV drying between coats. There were four coats total. I picked a pretty dark blue and absolutely love it! With my new growth and new color, it really makes me want to continue with growing my nails and losing my nervous biting habit. A whelp is a puppy. I think you mean welt, although that is a bump caused by a physical contact injury. The proper term for an allergic reaction, of the type that you appear to being attempting to describe, is a hive. I’m so glad you made the clarification. I don’t like reading comments or blogs because of the terrible spelling, syntax and wrong choice of words as in this case. Sometimes this alone is a bit entertaining! I have been getting gel manicures for quite some time and it all depends on where you get them done. I recently got them done(6 days ago) and they are all peeling and making waves in my nails. THIS IS HORRIBLE i much rather just get acrylic then to pay all this money just for it to peel off. 🙁 it looks good at first, but def not worth choosing over acrylic. It also damages your nails if not put on correctly. Are there any types of allergic reactions to cuticles from having the gel polish manicures? I have had very week nails for as long as I can remember and as soon as they get long they brake. I have tyres many different things to make them stronger but I have not found one that has worked yet. I have read some bad and good reviews and am still not sure. I want something that will last and harden my nails so they don’t brake. I have been looking at getting acrylic nails for a while but I don’t want them to damage my nails. Recently I have been looking into gel nails and reading reviews. I understand that where you get them done is a very big part of it not chipping and braking but I am worried about the UV light that drys them. Please someone help! I had a gel nail french manicure done around 10 days ago. It was the first time as I usually do my own nail painting. My nails are very strong thankfully but I hate having to repaint them constantly because of chipping. The gel manicure looked okay, not great though, but by the next day two nails had already started peeling off. I’d paid £40 at the Opi nail salon in Manchester airport for them! To make matters worse, I broke out in an angry red rash on my face and neck which then became hard, scaly and extremely dry. It feels like a chemical burn and has been so tight and painful. Getting these gel nails is definitely responsible and I’m obviously allergic to the formaldehyde. The nails had all peeled off within three days but I’m still struggling with the skin problems and have to use hydrocortisone cream on my face which comes with it’s own issues. Never ever again! Bottom line is that if gel is applied correctly, then no-one should have any of the issues being reported. Get them done properly by a recommended salon. The gel itself isn’t to blame for chipping or peeling – the application process is just as important. As for allergic reactions…I’m sure a reputable salon will allow you to have a small amount applied to 1 nail as a test before committing to having them done completely if you are concerned. Had a gel polish pedicure today, I have brittle toe nails, and they break easily. After much research decided to got ahead. The process was fantastic, and they look fab. Being a bloke I obviously decided to have a clear application of the gel polish, and my nails are now stronger feeling. I originally thought that this was for you girls, but my manacurisist told me that loads of men have this done for similar reason. I’m told it very hard wearing. I have had my gel nails for 2 weeks now and have not had any issues with chipping. And best part is I still have a good week or 2 before I have to go back (due to nail growth) I have not personally had the gel removed from my nail but I have a friend who did and her nail was still beautiful and strong. Just go to the salon where you got them done and have them remove it, since they are trained to do so. I am in ceramics and have class every single day other than the weekend, and my gel manicures and SOMETIMES REGULAR manicures stay in shape and perfectly fine! don’t know why some of you are complaining about it maybe because its too pricey for you!